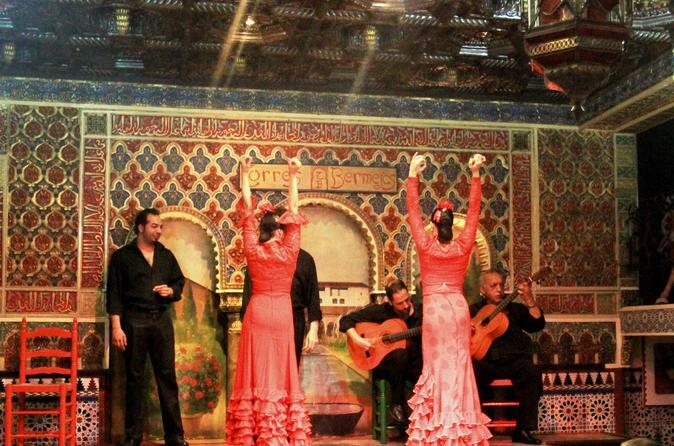 Immerse yourself in the traditional Spanish dance of Flamenco with an hour long lesson.The lesson will be followed by a Flamenco show at Torres Bermejas, one of the main flamenco tablao of Madrid.Choose to enjoy your show with a drink, a selection of 6 tapas, or delicious 3-course dinner with wine. Meet your Flamenco instructors at the predetermined meeting point to begin your 1-hour lesson.Dancers from the show, seen later on, will be heading the class.Dance to the tune of live music and authentic singing, set at level for all skill sets. After the lesson comes to conclusion, take a seat in front of the stage at the restaurant and enjoy your drink, if option selected. Drinks include wine, sangria, and soft drinks. Alternatively, enjoy your 3-course feast complete with wine or a typical selection of 6 tapas with a beverage. Then, see your teacher and Flamenco group perform a show, complete with live music performed by musicians and singers.Keep your eyes peeled to try and follow the accelerated choreography. Once the show is over, the rest of the night is yours to enjoy.